Request a quote for a bulk order for 5-formylcytosine (5-fC) polyclonal antibody - Classic. Please fill out the form here below. Your local sales account manager will get in touch with you shortly and send you a quotation based on your requirements. Polyclonal antibody raised in rabbit against 5-formylcytosine (5-fC) conjugated to KLH. HEK293 cells were transfected with a reporter gene and hydroxymethylated in vitro with either a pCAG expression vector containing the TET2 catalytic domain (TET2cd) or a negative control pCAG vector. 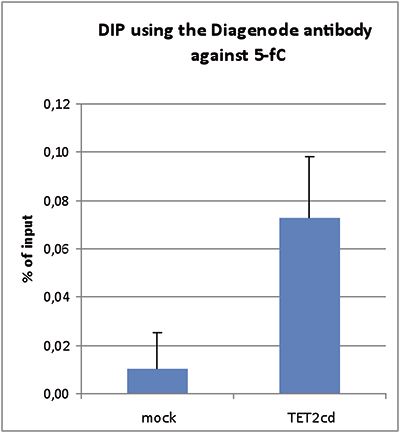 DIP assays were performed on 4 μg of sheared and denatured DNA using 3 μl of the Diagenode antibody against 5-fC (Cat. No. C15310200) in a total of 500 μl IP buffer. QPCR was performed with primers specific for the reporter gene. Figure 1 shows the recovery, expressed as a % of input (mean +standard deviation of 3 different experiments). To determine the titer of the antibody, an ELISA was performed using a serial dilution of the Diagenode antibody directed against 5-fC (Cat. No. C15310200). The plates were coated with the immunogen. 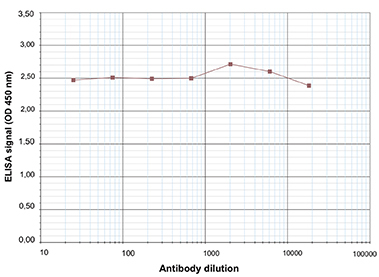 By plotting the absorbance against the antibody dilution (Figure 2), the titer of the antibody was estimated to be >1:100,000. Until a few years ago, 5-methylcytosine (5-mC) was the only known modification of DNA for epigenetic regulation. In 2009, however, a second methylated cytosine, 5-hydroxymethylcytosine (5-hmC) was discovered. This new modified base is generated by enzymatic conversion of 5-mC into 5-hmC by the TET family of oxygenases. Recent results indicate that 5-hmC plays important roles distinct from 5-mC. Although its precise role has still to be shown, early evidence suggests that 5-hmC may well represent a new pathway to demethylate DNA involving a repair mechanism converting 5-hmC to cytosine. As such it may play a role in the regulation of gene activity. This pathway includes further oxidation of the hydroxymethyl group to a formyl or carboxyl group, both catalyzed by TET oxygenases. The formyl and carboxyl groups of 5-Formylcytosine (5-fC) and 5-Carboxylcytosine (5-caC) can be enzymatically removed without excision of the base. Due to their structural similarity, the different modified cytosine analogues are difficult to discriminate. The development of highly specific affinity-based reagents, such as antibodies, appears to be the most powerful way to differentially and specifically enrich 5-mC and 5-hmC sequences. We previously released highly specific antibodies directed against 5-mC, 5-hmC and 5-caC. Now, we also present a unique rabbit polyclonal antibody against 5-fC. Diagenode strongly recommends using this:	5-formylcytosine (5-fC) polyclonal antibody - Classic (Diagenode Cat# C15310200 Lot# A1941-001). Click here to copy to clipboard.